Apple has released updates to iTunes 9.2.1 and iBooks 1.1.1 today. 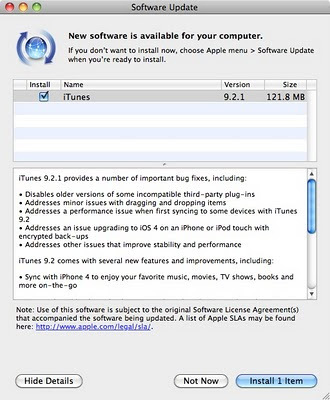 iTunes 9.2.1, available for Mac OS X and Windows PCs, is mostly a maintenance update that addresses bug fixes, performance issues, and will disable "older versions of some incompatible third-party [iTunes] plug-ins." I don't use any plug-ins with iTunes, but if you do, you'll want to double-check yours for iTunes 9.2.1 compatibility before applying this update. 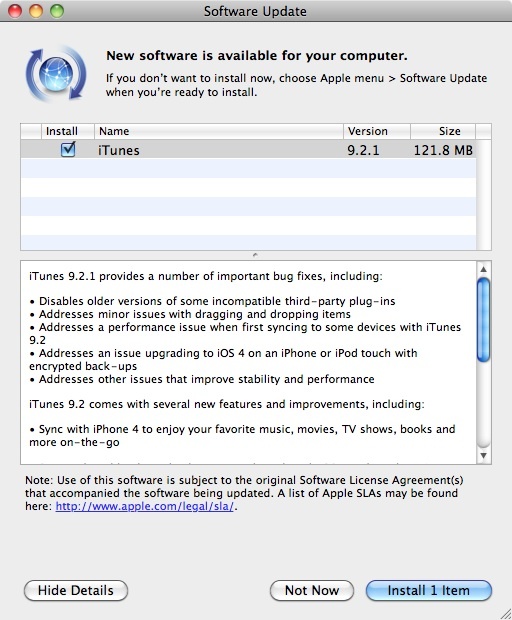 iTunes 9.2.1 is available for download on Mac OS X and Windows PCs from the Apple Software Update control panel. The iBooks update adds some nice features to Apple's ebook reader. This update includes improved support for books and PDF files with images and adds support for books and documents with audio and video content, as well as additional performance tweaks and bug fixes. You can download the iBooks update directly to your iPad or iOS 4 device by using App Store on the device or by downloading the update from iTunes and syncing it over to your iPad, iPhone, or iPod touch. The update hosed my iTunes install on my Netbook, an MSI Wind. Had to completely uninstall and reinstall 9.2. There are lots of complaints about the install on Apple's discussion boards. Staying away until they fix it. And, as if to make matters worse, the install does not clean up after itself at all (Apple blames Microsoft for this; surprised they didn't blame them for antennagate while they were at it). I actually had to use system restore to roll back a few days after completely uninstalling itunes (which said, among other things that quicktime wasn't installed, which it was, and completely able to run). Avoid unless required for some other reason.